The Recents menu (previously called Call Log) can be used to track incoming and outgoing calls on your account using the AT&T Office@Hand Mobile App. This can be done on any iOS and Android device. 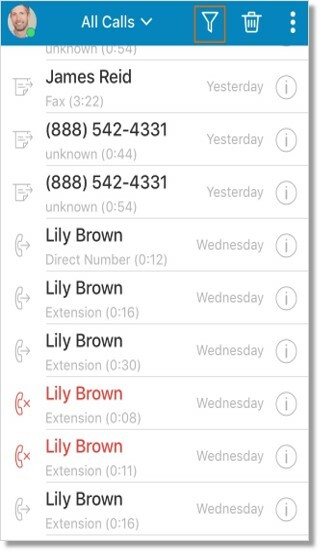 Recents (previously called Call Log) are used to track incoming and outgoing calls in your account. The AT&T Office@Hand Mobile App allows you to view your recent calls once you have started using your Office@Hand service. You can access this menu by tapping the Recents icon at the bottom of the Mobile App screen. Note: If you are using your Office@Hand Mobile App as an Administrator, the Recent Calls feature synchronizes with your Office@Hand Online account. Once you delete any logs from the Mobile App, you will not be able to retrieve it. You can do any of the following actions from the Recent Calls section of your Office@Hand Mobile App. Tap Recents, then tap on the Info icon across the number that needs to be called. Tap the Call button next to the number to call. Tap Recents, then tap on the Info icon across the number to send a text message to. Tap the New Text icon . Compose your message on the text box. Tap the Send icon . Tap Recents, then tap on the Info icon across the number to send a fax message to. 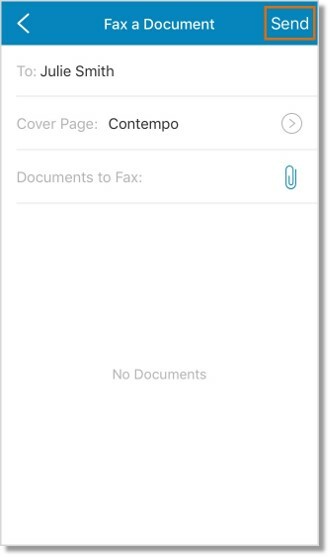 Set the cover page and/or attach the documents to your fax message. Tap Send. Note: This feature only applies to contacts that are not saved in your address book. Tap Recents, then tap on the Info icon across the number or contact to block. Tap Continue in the confirmation window. Once the number is blocked, you can unblock it by clicking on Unblock option. Tap Recents, then tap on the Info icon across the number or contact to unblock. Tap Recents, then tap the Delete icon . Note: You need to have Administrator access to perform these actions. Users who are logged in as the Administrator will see their personal extension’s Recent Calls by default. Tap Recents, then tap the Filter icon to view your available filters. Display your Personal or Company Contacts. Tap Done (for iOS) or the Check (for Android) button to save your preference.